Airport vending machines have been stepping up the vending game for quite some time. Most of it is thanks to a company called Zoom Systems. They are responsible for the Best Buy boxes in terminals, allowing us to purchase anything from a forgotten phone charger to a complete gaming system, and they have been at it since 2008. 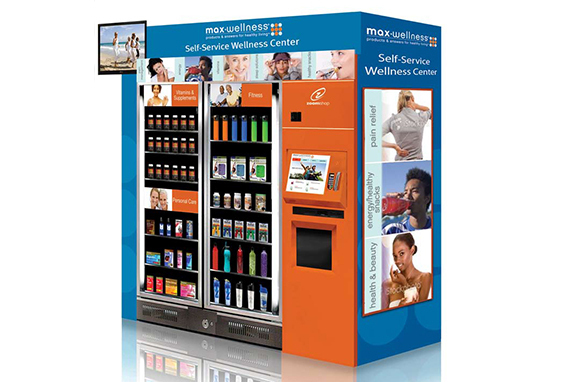 Zoom has also been rolling out machines for Benefit Cosmetics and Max Wellness across the country. The newest machine to catch attention is not part of the Zoom family, but rather created by/for Pepsi Co. This month, passengers at DFW get to experience the newest Pepsi Interactive Vending Machine at Terminal D. It will be there until May 26. Pepsi has been versioning interactive vending since 2011, and this new machine is the result of a partnership with Microsoft. The new machine uses Microsoft Kinect tech to create a touch-free, interactive soccer experience. Players can create an avatar, play 30 second games, view YouTube videos, and even charge mobile devices. Scoring 9,000+ points earns the player a free drink. High scorers can compete for "Hall of Fame" recognition, and selfie sharing is highly encouraged with the hashtag #FutbolNow, broadcasting frequent flier status or regular flight delays with style. San Francisco based Float Hybrid Entertainment designed the user interface.